The Wisconsin Student Planning Association (WSPA) is a social and professional organization run by and for UW–Madison planning students. 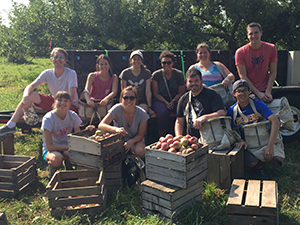 WSPA organizes social events and service opportunities for students, coordinates career networking opportunities, and works with department faculty to make sure the student voice is represented in department operations. Anyone is invited to attend WSPA meetings, which are held regularly during the fall and spring semesters to discuss faculty and curriculum issues, plan social events, and host guest speakers and career development workshops. WSPA also delivers a weekly email update to keep students apprised of events, announcements, job opportunities, and the latest in planning news. 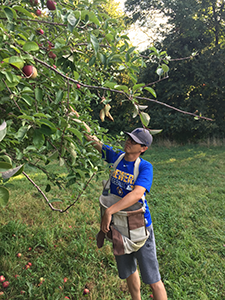 Members of WSPA picking apples on September 23, 2017 to donate to food pantries. 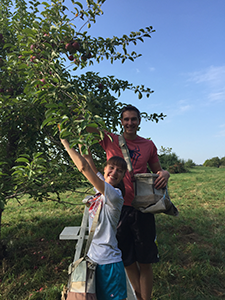 Members of WSPA with the apples they picked to donate to food pantries. 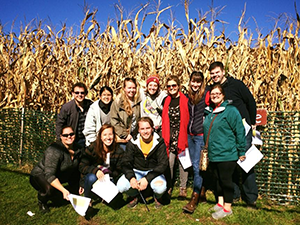 Members of WSPA on a trip to a local corn maze in Fall 2016. WSPA officers are listed below. If you have any questions relating to WSPA, department-student relations, or student life in general, please contact the appropriate representative. The Steering Committee Chair schedules and convenes meetings of the Steering Committee. He or she oversees elections and any proposed constitutional amendments. The Steering Committee Chair also serves as student representative to the Wisconsin Chapter of the American Planning Association. The Communications Director is responsible for keeping the minutes of all meetings and the meetings of the Steering Committee, manages WSPA’s web presence, and oversees communications within the organization and with the larger URPL community including, but not limited to, faculty, alumni, and professional planners. The media outreach coordinator manages the association’s social media platforms, seeking to engage and excite the association’s online and campus followers/audience. Additionally, this position is responsible for soliciting and analyzing member feedback about engagement strategies. Provide networking opportunities between current students, planning professionals and/or alumni. Ensuring that career development information is both accessible and current for current students. The Social Coordinator(s) provides WSPA members with opportunities to interact with one another outside of the classroom setting and promotes planning-related service learning in the Madison area. The Social Coordinator(s) also coordinates and plans graduation ceremonies with URPL faculty and staff. The Treasurer shall access and oversee the WSPA financial account. He or she creates a budget prior to the beginning of each fiscal year and keeps current records of all financial transactions. The Treasurer also checks the accuracy of all bills and invoices and paying them correctly and in a timely manner and initiates fundraising events. The Academic Liaison serves as a conduit between WSPA and URPL faculty by sitting on Faculty and Curriculum Committee meetings and reporting the relevant activities of those bodies to WSPA members. He or she also assists in communicating with perspective and incoming URPL students. The first-year representative is appointed by the Steering Committee during the fall semester. He or she gauges and communicates opinions of first-year students to the WSPA Steering Committee, coordinates first-year involvement and management at the graduation ceremony and reception, and assists the Steering Committee in carrying out its goals and actions. The Alumni Relations Council (ARC) Liaison will act as the student representative to the ARC, attending ARC meetings, helping to coordinate ARC events, and fostering connections between alumni and current students.